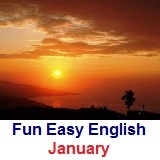 ﻿ Fun Easy English - new classroom free online classes english language lessons speaking listening writing reading january. 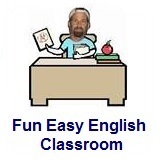 Welcome to the Fun Easy English classroom. Begin with the January 1 lesson and then continue on through the calendar every day. At the end of the year you will see a dramatic improvement in your English ability. Make 2019 the year you finally become the master of the English language. January 1 New Years resolutions: Lose Weight Welcome! January 2 Vocabulary: drunk, hangover Hello, I'm Anna! January 3 Should English be the world language? I'm Here! January 4 Why are you studying English? What Is It? January 5 What do you like about English? Where Are You? January 6 What do you hate about English? Where Is the Gym? January 7 Grammar: introduction What Are You Doing? January 8 Pronunciation: introduction Are You Busy? January 9 Reductions: introduction Is It Cold? January 13 Grammar: pronouns Happy Birthday, William Shakespeare! January 14 Reductions: whassup How About This? January 15 Ways to study English I Love People-Watching! January 16 Pronunciation: lesson 2 Where Are You From? January 17 Vocabulary: freedom of speech Are You Free on Friday? January 19 Slang: introduction When Do I Start? January 20 Pronunciation: lesson 3 What Can You Do? January 21 Vocabulary: activities Can You Come to the Party? January 23 Grammar: adverbs What Do You Want? January 24 Alphabet writing: letter A Yesterday Was Amazing! January 25 Idioms: introduction Watch Out! January 26 Vocabulary: American football This Game Is Fun! January 28 Alphabet writing: letter B I Passed It! January 1 - New Year's Day - Test your reading comprehension about New Year's Day. January 21 - Martin Luther King Day - Test your reading comprehension about Martin Luther King Day.